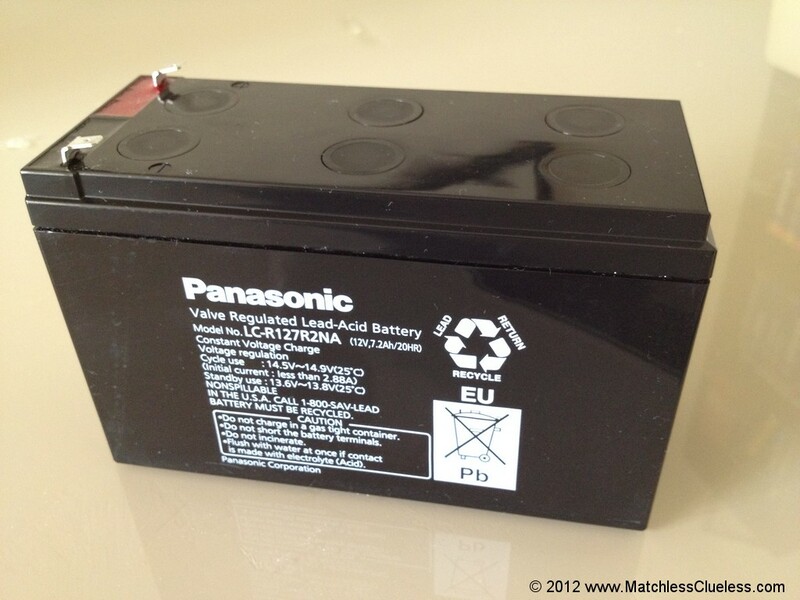 A guide to selecting a new 6 or 12 volt battery for a classic AJS or Matchless motorcycle. The existing Exide motorcycle battery I have installed on my Matchless G3LS doesn’t seem to be holding charge as well as it did, so I figured it was about time I replaced it with something that looked a little more in keeping with the rest of the bike. I bought the Exide unit a year or two ago when I was back in India after the previous custom-made 6v unit failed after only 6 months. There wasn’t exactly much choice in batteries and whilst converting to 12 volts helped, it was really just a case of finding something that would just about fit within the battery carrier. Here in Hong Kong I figured I would have access to a greater range of batteries. I would also be able to order one of the dummy battery boxes from a supplier back home in the UK so that I could get the bike looking a little bit more original without the bright red modern Exide battery box on its left side. As it turned out there are actually quite a few different battery options and selecting the most appropriate requires a little knowledge of batteries and of the original Lucas types fitted to such classic motorbikes. This article is a summary of what I found, some of the possible options and what you should look for if you’re also replacing your classic motorcycle’s battery. It is written with specific regard to my 1951 Matchless G3LS, but as the same batteries and carriers were fitted to many British bikes of the 1940’s, 50’s and 60’s it will equally well apply to most other makes and models. What battery did I chose? Now looks aren’t usually the first thing I consider when working on my old bike as there are many more practical considerations and limitations to keeping it on the road that usually get in the way first. However, the externally mounted battery on the Matchless and AJS models up until the mid-fifties is such an integral part of the way the bike looks that it is important to get right. If you have a later model bike where the battery was safely hidden away in the larger ‘tool boxes’ then you can probably skip this bit. The original Lucas battery was mounted in full-view just under the front of the seat on the left side of the bike. Visually it fills the gap behind the carburettor in the same way that the oil tank does on the other side. Thankfully there is a solution which offers a compromise between the looks of the old batteries and the performance of modern units by way of using a dummy battery case. 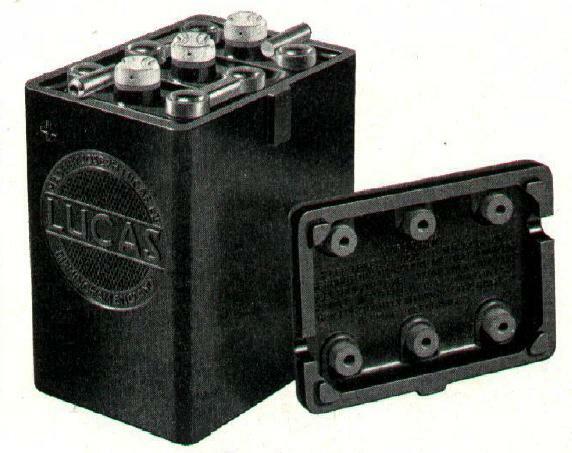 This is a moulded plastic box which looks identical to the original Lucas battery on the outside, but is hollow on the inside so you can add your choice of modern battery or batteries. These are available from all the usual classic motorcycle parts suppliers. The size of the battery is important to get correct so that the battery fits within and is securely retained by the battery carrier. The original Lucas PU7E / PUW7E / PUZ7E batteries measured 4 13/16″ wide by 3 9/16″ deep by 6 3/8″ tall, which works out at approximately 122mm x 90mm x 162mm (W x D x H) in metric terms. (From what I can gather, the only difference between the three battery types is whether they were supplied ready filled with electrolyte or dry for export purposes). There is some flexibility with the width of the battery as the carrier doesn’t have sides; my old Exide battery was actually a fair bit wider than the standard battery but still fitted in the carrier and looked ok. However the depth and height are critical in order for the battery to be securely clamped in place by the metal strap. If you are using one of the dummy battery cases shown in the picture above it is important to select batteries that will fit snuggly inside (perhaps with some padding) so that they don’t rattle around too much. The internal dimensions of my Lucas ‘King of the Road’ battery box are approximately 115mm wide by 84mm deep. The internal height of the box is 137mm but combined with the 18mm recess within the lid, this gives a total internal height of around 155mm. I assume that other models of the dummy battery box will be of similar size in order to match the same original Lucas battery designs, but no doubt there will be a slight variation in the mouldings. It’s therefore probably better to buy and measure your dummy box first before ordering the batteries to go inside, or else order them all together as a package. The first thing to consider is obviously the voltage of your motorcycle; is it 6 or 12 volts? Six volts was standard for the older machines up until the late-fifties or early sixties with twelve volts being the more modern setup. The advantage of 12v over 6v is that more volts mean less current for a given electrical power, hence the effects of resistance (e.g. old wiring, dodgy switch contacts or bad earths) are less. Therefore less power is wasted as heat within the wiring loom. If your machine is still setup for 6 volt running then you may wish to consider switching to 12v. This is easily done using one of the modern solid state electronic voltage regulators which replace the mechanical units on dynamo equipped bikes. You will of course need to replace the battery (you’re doing that anyway, right? ), bulbs and fuses, but it opens up a greater choice in 12v accessories (e.g. LED bulbs) than the often limited 6v range. You can read more about this topic in my ‘Converting to 12 volts’ article. The original Lucas PU7E / PUW7E / PUZ7E units were 7 plate batteries (hence the ‘7’ in their model codes) and were listed as 12Ah capacity (at 10 hour rate) and 14Ah capacity (at 20 hour rate). The two different figures are because the actual capacity of the battery depends upon how quickly it is discharged. The faster it is discharged (i.e. the more current drawn) then the lower its capacity will be as more energy is wasted overcoming the internal resistance of the battery itself. Which value is better to go by? Well neither really – a 35W bulb draws just under 6 Amps at 6 volts which would discharge the battery is around an hour, so actually a 1 hour rates would be far more useful to go by, but these are not always provided by manufacturers as they don’t look so good. However, it’s not that important really so long as you are comparing the capacities of different batteries based upon the same discharge rate. I mention this because some manufacturers or suppliers may quote batteries using a 100 hour discharge rate which make the battery look far batter than it actually is. Faster discharge rates are a harsher measure of battery capacity. So if your bike is running with 6v electrics, you need a battery rated at around 12 to 14 Amp-hours (Ah) or more to equal the original capacity the manufacturer intended. If for example you have fitted higher wattage headlamp bulbs than standard or electronic ignition, then you may wish to install a larger battery capacity to give you a bit more running time in the event of charging problems. Modern batteries are able to cram more capacity into the same physical size so this is indeed possible. If you have ‘upgraded’ your bike to 12v electrics then things are slightly different. The extra volts mean that you need correspondingly fewer amps for the same output power. A 6v 35 Watt headlamp bulb requires just under 6 Amps (35W / 6v = 5.83A) whereas a 12v 35W bulb needs less than 3 Amps (35W / 12v = 2.92A). A bike with 12v electrics therefore doesn’t need a battery with as high a capacity, but instead one with about half the Amp-hour rating would normally be sufficient. Therefore a 6 or 7Ah battery would be fine and anything more than this a bonus. Once you know the limitations in terms of battery size, electrical specification and where it needs to fit, it is then a matter of decided what type of battery you wish to install. There are a few different variations of the basic lead-acid battery, some more conventional and others more modern. The most popular of these are discussed in the following sections. The basic battery type which was originally fitted to all classic bikes is the standard ‘wet cell’ or ‘flooded’ lead-acid battery. As the name suggests, these are formed by lead plates which are immersed in a sulfuric acid bath which is free to slosh around inside the cell (and indeed spill out if the battery is not kept upright!). The battery is made up of a number of cells each of which gives approximately 2v of output, so the total voltage of the battery is determined by the number of cells it contains. The battery has a row of caps that can be unscrewed in order to look inside and check that the plates are still covered to the correct height with the electrolyte. Charging can cause the battery to ‘gas’ which means that the electrolyte level will fall reducing performance, and so frequent top-ups with distilled water are required. The gasses released during charging (oxygen and hydrogen) are extremely flammable as so care must be taken when charging to avoid the potential for explosion. The acid also has a tendency to leak if the battery is damaged or not kept upright, and this can burn skin, damage clothes and worst of all, melt the paint on your precious motorcycle! The only possible advantage I can see for sticking with this traditional battery type is to maintain authenticity. However I think this is probably taking originality a step too far for most classic bike owners given the advantages of the other more modern battery types described below, especially with dummy battery boxes readily available to make a modern battery look authentic. The terms ‘sealed’ and ‘maintenance-free’ can often be confusing and misleading as they may be applied to various different types of lead-acid battery. 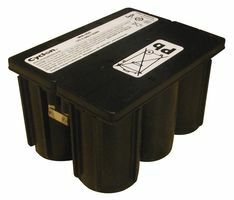 The terms were originally applied to traditional ‘wet’ lead-acid batteries as described previously, but where the units are sealed such that no topping-up of the electrolyte is necessary. Instead the manufacturer ensures that each battery contains enough electrolyte when it leaves the factory to last it through its expected life or warranty period under normal usage. This also helps to avoid the risk of spilling battery acid when moving or charging the battery. However, these terms are also used to describe the more modern ‘absorbed glass mat’ (AGM) and ‘gel’ batteries that are discussed in the following sections. Therefore take care to understand exactly what type of construction is actually being referred to when a supplier or manufacturer uses these phrases. Valve-regulated lead-acid batteries, or VRLA’s for short, are a modern evolution of the traditional wet lead-acid battery that are truly sealed and maintenance free. It is not necessary (or indeed possible) to check or top-up the electrolyte levels. They can also be mounted in any orientation because they are sealed and there is virtually zero chance of leakage. Their advantage over older ‘sealed’ wet cell lead-acid batteries is that rather than relying on holding sufficient electrolyte to last their expected lifetime from new, they instead actively recombine gasses generated inside the cells so that no electrolyte is ever lost. During charging of a conventional lead-acid cell, oxygen is produced at the positive plate and hydrogen at the negative plate. Therefore the electrolyte must be regularly replenished to make up for this loss. In a VRLA battery, manufacturers have found a way to allow these gasses to recombine rather than escape, and hence such units are also called ‘recombination’ batteries. 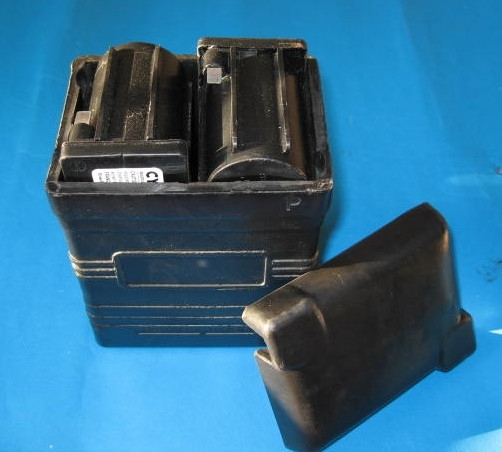 These are the safest lead-acid batteries to use both because of the low risk of acid spillage and also because no explosive gasses are produced during charging. There are two main types of VRLA battery: ‘absorbed gas mat’ and ‘gel-type’. Both terms refer to the construction of the battery and how the electrolyte is held between the plates. The main type of valve-regulated lead-acid battery is called ‘absorbed glass mat’ or just ‘AGM’ for short. In an AGM battery, the separator (the insulator between the conductive battery plates) is made of porous glass fibre mat. This absorbs the electrolyte, rather than it being free to slosh around as in a conventional wet lead-acid battery. This construction also gives better discharge and recharge efficiency as the electrolyte is suspended close to the plates. Such batteries also have significantly slower self-discharge rates than conventional lead-acid batteries so they retain their charge longer when not used for days, weeks or months. This makes them ideal for classic bikes which might only be used once a week or so, or laid up in storage over the winter. Absorbed glass mat VRLA batteries are therefore probably the most popular choice these days for motorcycles of all ages and types, as well as for applications as varied as wind turbine power storage, wheelchairs, emergency lighting and backup power supplies. 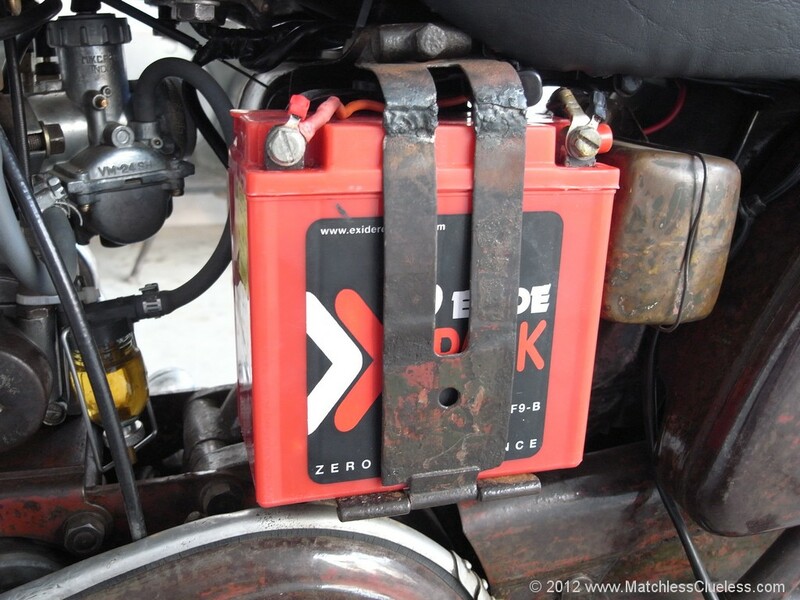 Most batteries supplied specifically for motorcycle applications are now of this type. 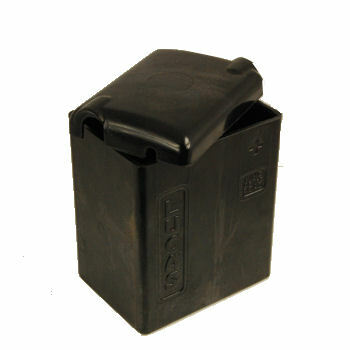 This is another type of valve-regulated lead-acid battery. Gel batteries refer to a type of lead-acid battery construction where the electrolyte is suspended by the addition silica additive that causes it to set within the cells. They have the have same sealed and maintenance-free properties as an AGM battery, but are typically more sensitive to charging voltages and may require a special charger. For this reason I’m not sure that they are necessarily a good choice for classic bikes where charging voltage from the dynamo is often not well regulated. Gel batteries are being replaced by AGM batteries in most applications and they do not appear to give any particular advantages. 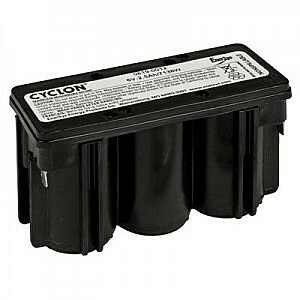 Cyclon batteries are a specific type of AGM VRLA battery manufactured by Hawker Energy Products Inc, and others. Quoting the application guide: “Cyclon Valve Regulated Lead Acid (VRLA) Cells and Monoblocs are a unique technology using wound electrodes made of pure lead (99.99%) alloyed with 0.65% of tin.” Whilst not specifically designed for classic motorcycles, they have become rather popular for this application for a number of reasons. The first reason is that two of the 6v 5Ah Cyclon battery units fit neatly side-by-side in a dummy Lucas battery case. These two batteries can be connected in series (one after the other) to give 12v 5Ah total output, or in parallel to give a double capacity 6v 10Ah battery. This gives a very neat installation. The other significant advantage of this battery type is that they have a very low self discharge rate and so can be left for long periods between charging, making them ideal for the typical non-daily use of most classic bikes. They retain a high percentage of charge even if left for several months so you should have no problems when you first ride the bike again after a long winter layup. They also seem to be quite robustly designed and built units and should therefore be able to endure the vibrations, bumps and knocks that they will no doubt encounter whilst being attached to any classic British motorbike. A Cyclon VRLA battery (or two) would therefore be my recommendation for most classic motorcycle applications. The extra cost of these units should be more than offset by their longer life in the difficult conditions of an old vibrating motorbike with a potentially dubious charging system! If you decide to go down this route, the Cyclon model to look out for is a “0809-0012” as shown in the picture on the right. This is a 6 volt ‘Monobloc’ battery formed from three 2v nominal Cyclon cells packaged together in a plastic outer container. Their capacity is 5Ah at the 10 hour discharge rate, or 3.99Ah at a 1 hour rate which is probably more useful for working out how long your headlamp will stay on for. This is probably a little on the low side (remember the original Lucas unit was about 12Ah), so installing two of these batteries wired in parallel (connect the two positive terminals together and the two negative terminals together) will give a more reasonable 10Ah total capacity. I’ve also seen model number “9064W” mentioned for this battery. They measure approximately 77mm x 139mm x 54mm (W x H x D) so you can see how one or two fit neatly inside a dummy battery case of internal dimensions roughly 84mm x 155mm (including lid recess) x 115mm. Wiring two of these 6v batteries in series (positive terminal of one battery to the negative of the other) will double the voltage to 12v whilst maintaining the same 5Ah capacity. An alternative is to buy one of the 6-cell Cyclon monobloc units which are basically two of the 6v monoblocs joined together as one unit. The model number for this 12v 5Ah battery is “0809-0020” and it measures 106mm x 139mm x 77mm. A picture is shown on the right for reference. Be careful when ordering these type of batteries as there are smaller (2.5Ah) and larger (8Ah) capacity alternatives that look almost identical apart from their size. I’ve double checked and the 8Ah batteries are sadly just a little bit too big to fit inside a Lucas dummy battery case. I thought it also worth mentioning a few battery types to avoid. Firstly the most modern types of lithium ion (Li-ion) and lithium polymer (Li-Pol) batteries used in mobile phones, laptops and other such gadgets are not suitable for use with classic bikes. These batteries have a higher energy capacity than lead-acid batteries, but they require special charging and regulation processes to maintain safe operation. Sadly the Lucas mechanical voltage regulators are not up to the job, and even modern solid state motorcycle regulators are not designed for use with these batteries. Not that I’ve seen any such batteries that will fit an old motorbike anyway, but worth mentioning in case someone decided to rig something custom up for themselves. Whilst I have concluded that absorbed gas mat (AGM) sealed lead-acid batteries are probably the most suitable for our classic bikes, there are many variations in construction and some are not as suitable as others. The main ones to avoid are ones that are designed mainly for stand-by power use in emergency lighting, uninterrupted power supplies (UPS), and such aplications. These will generally not be able to withstand the vibration and shocks of being strapped to an old motorcycle, and they are designed for continual trickle charging rather than cyclical charging on a vehicle. Look for AGM batteries that specify that they are vibration resistance or are designed specifically for motorcycles (or maybe similar applications such as in electric wheelchairs, golf buggies, lawnmowers, etc). My recommendation to anyone looking to replace the battery on their classic motorcycle would be to go with one (or two) of the Cyclon units I described above. The slow self-discharge rate when not being used and their neat fit inside one of the dummy Lucas battery cases can’t be beaten, although you of course also need to take into account cost and availability wherever in the world you live. That was my problem when it came to buying a Cyclon battery here in Hong Kong as I couldn’t actually find any local suppliers and those back in the UK were unable to ship batteries internationally. I did find one supplier (Element 14, known as Farnell back in the UK) who could delivery to Hong Kong, but the cost worked out at approximately £50 for two 6v units which was just too much of a premium to pay. Instead I decided to go with an AGM battery that I could buy off the shelf at one of my local electrical shops. The model I chose was a Panasonic ‘LC-R127R2’ which is a 12v battery with 7.2Ah capacity at the 20 hour rate (6.5Ah at 10 hour rate or 4.9Ah at 1 hour rate). This was a perfect fit inside my dummy battery case with about a 10mm gap on all sides for some foam padding. The manufacturers general description is as follows: “Panasonic’s tough VRLA rechargeable batteries are designed to provide outstanding performance in withstanding overcharge, overdischarge and resisting vibration and shock. The use of special sealing epoxies, tongue and case construction assures that the battery will offer exceptional leak resistance. AGM separator material is a highly porous, absorbent micro fiberglass mat mixed that immobilizes the electrolyte and creates a situation where a spill of electrolyte is highly unlikely.” Sounds good! The self-discharge rate is also very low with a specification of 91% of the charge remaining after 3 months, 82% after 6 months and 64% still there after a year. So I decided that this was a good alternative to a couple if Cyclon units as it would cost me a much more reasonable £15. But I’ll probably get a Cyclon battery next time when I’m back in the UK and they are more readily available at reasonable prices. The first thing to do when you get your new battery is to check it thoroughly for any leaks, cracks or other damage that might compromise its integrity. If in doubt, return it and get it exchanged for another one. The next thing to do is to give it a good charge with an appropriate battery charger. It is worth getting a more sophisticated charger that continually monitors the battery voltage and current it is accepting during charging to ensure that it charged at the optimum rate and not overcharged. Such chargers can also often try to recover batteries that have lost capacity due to effects such as sulphation of the cells, and can usually provide a trickle charge to keep the battery at peak condition once fully charged (sometimes called a maintenance charge). Cheaper battery chargers tend to supply only a fixed voltage and / or current to the battery which can lead to gassing (and a risk of over-heating and maybe even explosion), overcharging or just not able to attain a full charge. It’s worth investing in a decent charger – I bought an ‘Accumate 6/12v’ (about £45 from memory) a couple of years back which I have been very happy with. This charges both 6 and 12v batteries, supplies a trickle charge once the battery is full and can therefore be left connected indefinately to maintain the battery in optimum condition. Finally but perhaps most importantly, ensure that you fit a fuse if your bike doesn’t already have one to prevent total meltdown of the electrics in the event of a problem. More info on this can be found on the ‘Installing a fuse’ page. In conclusion to this article my advice is to get your old bike one (or a pair) of the Cyclon batteries fitted neatly inside a dummy battery case to maintain original looks whilst taking advantage of modern battery technology. If the Cyclon batteries are not available or cost too much where you live, then an absorbed gas mat (AGM) valve-regulated lead-acid (VRLA) battery is almost certainly the next best thing so long as you select one which can withstand the vibrations and shocks of being fitted to a classic motorcycle. If you have any thoughts or comments on this article, or maybe some experiences with batteries of your own that you would like to share, then please get in touch using the comment form jsut below. I would love to hear from you! A friendly disclaimer in case you do something silly! This article and website are based upon my own opinions, experiences, mistakes and successes and is provided for general interest and information purposes only. I hope you find it useful, but please do not rely blindly on anything I have written or done myself. You and your bike are different to me and my bike and so other considerations may apply. Any damage you inadvertently do to yourself or your bike is solely your own fault; I cannot be held responsible for your actions! The full terms and conditions for my website can be found here. I read the article on choosing a battery for a classic motorcycle. You don’t appear to mention a problem with some pre war charging circuits (eg 3rd brush Miller) which may overcharge the battery which then gets hot. The modern battery in a replica case is not suitable for these circumstances. The original lead acid battery with vents is better able to cope especially if its capacity is fairly large, say 13 Amp hour. Hi Keith. Interesting point regarding the over-charging issue with some pre-war charging systems and not something I have any personal experience of. Over-charging (i.e. too high a charging voltage being supplied by the regulator) is going to be bad news for any battery. Maybe in a traditional vented battery the gas can escape easier and the electrolyte levels can then be topped up. But personally I wouldn’t want to be sat astride any battery that is getting hot or gassing due to the acid spill or explosion risk! Modern AGM or gel type batteries are much safer in this respect. So surely it would be better to correct the over-charging issue? I ran my 1938 Francis Barnett machine (currently under restoration) for several years in the early 1960s with no acid leaks or other problems. In fact 450 miles in a (1960) day was my record distance until 1974 on a BMW R69S. The overcharging issue is not huge. There was a resistance in the headlamp switch to throw away heat when the headlamp was off. Heat dissipation from the battery is essential and not helped by putting two modern batteries in a case. The industry solved the problem with improved regulating systems and can now be done retrospectively but would not be authentic. I am now having trouble finding a wet lead acid battery of the correct capacity (13ah) and shape to fit neatly. Thanks for the info, you hugs know your stuff. Hi Jerome, useful article, thanks. I’ve a long history of electrical gremlins with vintage/classic bikes! My last open vent lead acid overheated & vented, ruining my brand new chromed silencer… Having had all sorts of problems from flat batteries to burnt out dynamo’s to electrical fires I cannot recommend fuses highly enough. They would have saved me an awful lot of heartache over the years & I now have them everywhere! Anyway, I’m looking at alternatives to std lead acid for a 50’s BSA single (vibrations!) mainly due to having the bike standing over winter & forgetting the battery (2 chargers in use already elsewhere). Moving bikes in & out & around the shed means it’s easy to neglect the bike that’s shoved in a corner & gets used least. I had an old Suzuki single that was on ni-cads seemingly ok (previous owner’s fitting) & wondered about using them on a vintage bike. I tried Cyclons many years ago but can’t say they were better than std considering the expense. But then I did have a lot of other gremlins going on! At the time I was supplied with a 6v pair, wire linked for 12v but suspect spade connections are not ideal in this use (a 12v battery than can “break in two” is not good). Soldered wire links may have been better. I expect the one piece 12v is the way to go but as you say, it doesn’t fit a replica case. It’s a shame Cyclon don’t market a “reversed pair” compact one piece for the vintage m/c scene that would fit. That said, it wouldn’t be impossible to make an oversize cover to hide the battery. Perhaps another good charger is the simplest solution for me. I’ve been happy with the 12v AGM 7ahr on another old single in more regular use that holds it’s charge reasonably well when occasionally neglected. I converted both bikes to 12v & modern regulators more for ease of replacement bulbs when out & about. Petrol stations stock very few useful service items these days, let alone 6v bulbs (Of course it seems to me that LED rears are the way to go now). Funnily enough I have used a 3Ahr “alarm” type battery in a race bike with no problems – mounted on the bottom fork yoke but obviously only running a digital / coil ign system, not lighting! Hi Charles. 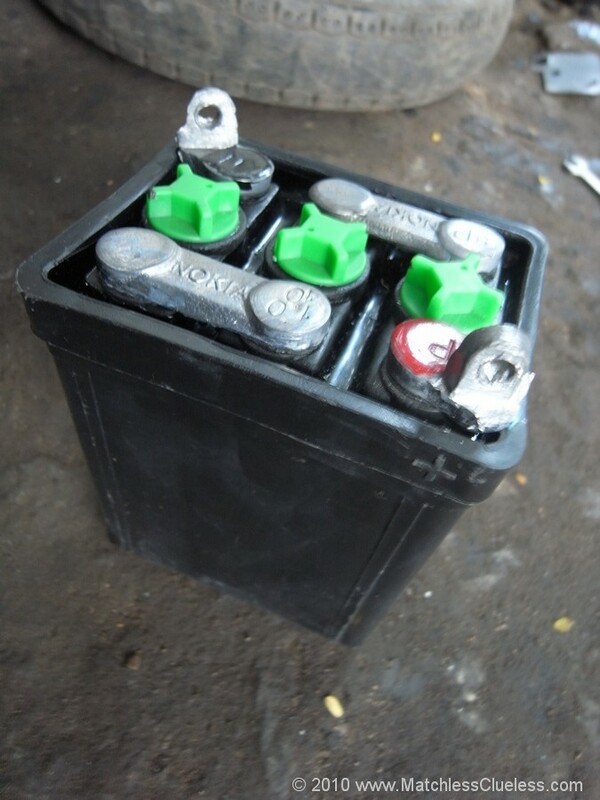 To connect two 6 volt batteries together to form a larger capacity 6v battery, connect their two positive terminals together and then their two negative terminals together. Then connect the bike to the positive and negative terminals of one of the batteries, so that one battery has two wires from each terminal (one to the other battery and one to the bike). You could use these 1/4″ piggy back terminals to connect +ve to +ve & -ve to -ve available at any spares shop. I have heard old Geezers talking of Cyclons & thought they were capacitors? This article gave me all I wanted to know – Cheers James, top job. my (expensive) cyclon within the old black lucas case lasted one season.then dead when wanted after winter layup.have used now sealed lead acid 6v4ah, wired together to give 8ah.two fit into old case and are very cheap at local tool shop.will be fourth year of use on my 1953 g80.fit and forget. I am looking for a batteri to my Royal Enfield Bullet 1951, 6 volt. Found a Samson which is supposed to be for veteran bikes. The looks is very old fashioned and dimensions and capacity fits well with replacing the old Lucas PUZ7E. I have never heard of Samason batteries though. Anybody who has experiance of it? Good or bad? I’ve never heard of Samson/Samason batteries myself, but many batteries are unbranded or from unknown brands. If it fits and is the right spec and price then its worth a go I would say, but then you’ll just have to wait and see how it performs and how long it lasts. A good maintenance charger should help maximise capacity and lifespan though. Hello! Thanks for sharing your investigations. I would like only to put a question: What about the charge cycle with a Dynamo? I was fearing this could be the weak point to fit an AGM battery in my bike. Thanks!! rods door locks, hardware tools. know the procedures so that we go ahead with the business.